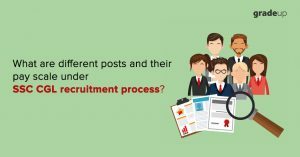 What are Different posts and their pay scale under SSC CGL Recruitment 2018-19? Staff Selection Commission conducts Combined Graduate Level exam to recruit officers in various government departments. The profiles and job roles vary as per requirements of a department. The salary also varies from one post to another. The candidates must know about salary structure so as to make a start of good career path. In this article, we are sharing pay scales of posts under SSC CGL Recruitment 2018. Since the number of posts is large in number, we are calculating grade pay wise in hand salary. In the first part of this article, grade pay wise in hand salary is given and in the second part of this article post wise job profile, role, career progression and grade pay is given. Download SSC CGL exam preparation app, and free study notes, quiz, mock test, topic-wise, and previous year question papers of SSC CGL exam.